DOWNLOAD HERE or click cover. What happens when you bring the sounds of Hip-Hop’s Top 5 MCs together with one of Rock’s Top 5 Bands and mix it all up with one of the mixtape game’s most creative djs? 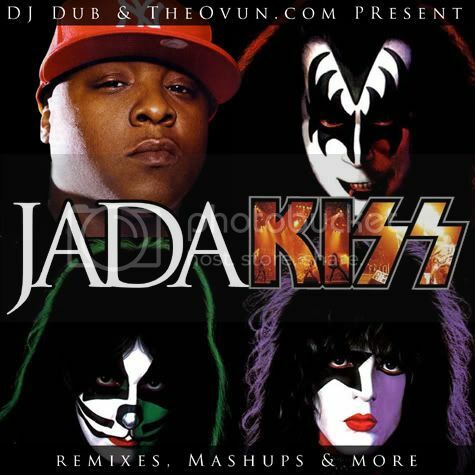 DJ Dub & TheOvun.com present “J-A-D-A KISS” and the end result is geared to be one of the year’s best mixtape offerings. While some might expect Jadakiss’s raspy tone to be fighting against the loud fracas of guitar solos and wailing vocals, thats far from the case on this project. This Remixtape is made to highlight the lyrical prowess of Jada and legendary musicality of Kiss. Dub is no stranger to concepts such as this with past projects including CRS (Kanye, Pharell & Lupe), Heavy Metal (Ghostface & MF Doom) so of course, Dub executed this with no problem.